An excellent and very well executed solution to the problems of chaining hardware processors. Simple connections. Clean signal path. Ease of use. Flexible. Problem-solving. Looking for a decent analogue control device to act as a hub for your hardware processors? Then rejoice! You've just had your prayers answered by SPL, in the form of the Masterbay S Model 1150. Setting up chains of analogue signal processing can be a complex business. Some gear doesn't have a bypass switch, some doesn't have input level control and some, no output adjustment. Many A/D and D/A converters also don't allow for simple gain control and these issues can make life complicated, particularly in mastering chains. SPL has years of experience building custom mastering consoles for some of the most famous mastering houses in the world. The Masterbay S is its off-the-shelf answer to these issues. As this is primarily designed to be used as a mastering chain, let's go through how to set it up for that particular purpose. "It's all very straightforward to connect up and there are no odd cable combinations to source"
On the back panel are a pair of inputs labelled Main In. This is where you patch your DAW output. There are then four stereo insert points into which you put your various stereo processors. Insert 1 would be the place to put your corrective processing, such as a de-esser, or maybe an M/S processor to control stereo width. Inserts 2 and 3 can be swapped (3 inserted before 2) so this is the place to put your compressor and EQ. When mastering, you would usually want to EQ after compression, but not always, so this flexibility is very useful. Position 4 would be the place to put your limiter (or another compressor) as it's the end of the chain. There is also a Record Out to feed back to your DAW and a Monitor Out to connect to your monitor controller. Every input and output is on an XLR except for the Metering output, which is on 1/4-inch jacks, so it's all very straightforward to connect up and there are no odd cable combinations to source. Having got yourself plugged up, it's time to look at what the front panel does. The first thing to note is that all the level controls are switched. 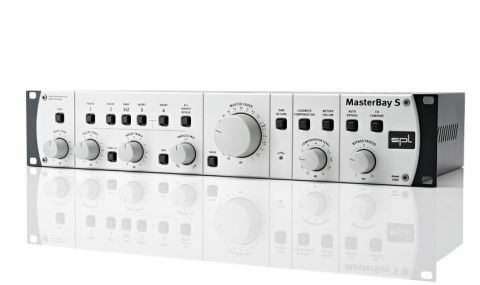 SPL has been very thorough in ensuring that the signal path through the Masterbay S is as pure as possible - that includes removing any level controllers that might be superfluous to the specific task in hand - exactly as a mastering console should be. "SPL has been very thorough in ensuring that the signal path through the Masterbay S is as pure as possible"
Working left to right, we begin with Input Trim. D/As can often throw out quite a bit of level and while that may suit a lot of modern analogue gear, many vintage units aren't designed to run that hot. The Input Trim enables you to take the signal down (or up) by up to 6dB. All the potentiometers used on the Masterbay are of a very high quality, so rest assured that you get level control and nothing else. The four insert points are all individually switchable so if you have a favourite vintage stereo compressor with no bypass it will frustrate you no more. Between the Insert 2 and 3 buttons is the Swap 3>2 control. This simply reverses the order of those two insert points, as described earlier. After insert 4 there is a switch that bypasses all the insert points. When you switch this, any insert that is in is bypassed and its switch flashes to tell you so. Below the input switches are three pots and two switches. The first switch is Trim L/R, which engages the Insert Trim L and R controls. These work after the first three inserts and enable you to correct any stereo level imbalance you might have. After that comes the Mix switch, which brings the Parallel Mix control into play. This enables you to blend the output of the first three inserts with the input signal and is a welcome addition. Parallel processing was once the domain of pro engineers, but this means you can utilise it simply and easily with all your gear. As mentioned earlier, Insert 4 comes after all this as it's where you would put any final limiting stage or final EQ that you don't want to be part of any parallel processing chain. Finally there is the big Master fader, which enables you to set a master level back to your DAW and make real analogue fades, should you so desire. It goes from infinity to +7dB so there's plenty of gain make-up to be had, should you need it. First up here is the DAW return, which simply puts your recorded return from the DAW into the monitor-out path so you can check a mix back and see what the converters are doing to the sound. Next comes Loudness Compensation. This is very useful as it enables you to lower the monitor level of the processed output to match the unprocessed input signal. To most of us, louder sounds better, so this enables a more impartial view of how your processing is affecting the sound. Meters Follow enables you to see that compensated level on any meters if you have them connected. Finally comes Auto Bypass and I/O compare. As you'd expect, I/O switches the monitor out between processed and unprocessed signal. Auto bypass automatically switches between input and output at a rate determined by the Bypass Period control. This means you can sit back and automatically compare what you have just done without having to touch a button. Very handy and a darn sight cheaper than having an assistant to press that button for you. The Masterbay S might not be the most obvious of devices, but it solves a lot of the niggles common when building analogue processing chains. It can also be a really great tracking solution, too, especially if you like to print FX with a sound. As with all SPL gear, it is beautifully constructed, simple to operate and sonically transparent. With its extra level controls and Parallel Mix functions it adds functionality and creative possibilities to a wide range of gear and should speed up quite a few recording and mixing processes.